Curling irons, also known as curling tongs, create waves or curls by using heat to manipulate the hair for a short period of time. Ancient curling irons date back over 6000 years and were simply rods of iron or bronze heated over an open flame. They were used to curl hair, beards and wigs. The first patent on a curling iron was made in 1866 by Hiram Maxim, who also happened to be the designer of the machine gun. In 1872 hairdresser Marcel Grateau invented the "Marcel Wave" and designed an iron to achieve this style in 1880. The temperature of early irons was very hard to control and women often burned their hair and skin using them. The electric curling iron was invented in 1959 by Rene Lelievre and Roger Lemoine and allowed for temperature control. This electric curling iron revolutionized hair curling as it allowed for more consistent curls and waves and reduced the risk of burns. The vintage curling iron featured above is owned by Georgina Mercer of Bishop's Cove and had once belonged to her grandmother. 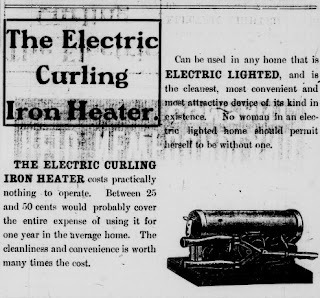 This style of curling iron was heated over a wood stove or oil lamp. In order to protect hair from burning, women would often use brown paper as a protective barrier between the hair and the iron. Some women placed the iron directly on the hair, only using the paper to test the heat of the iron before use. Mercer explained to me that the only time she used this iron was on her grandmother's hair and she nearly burned it right off her head! I actually have one of these!